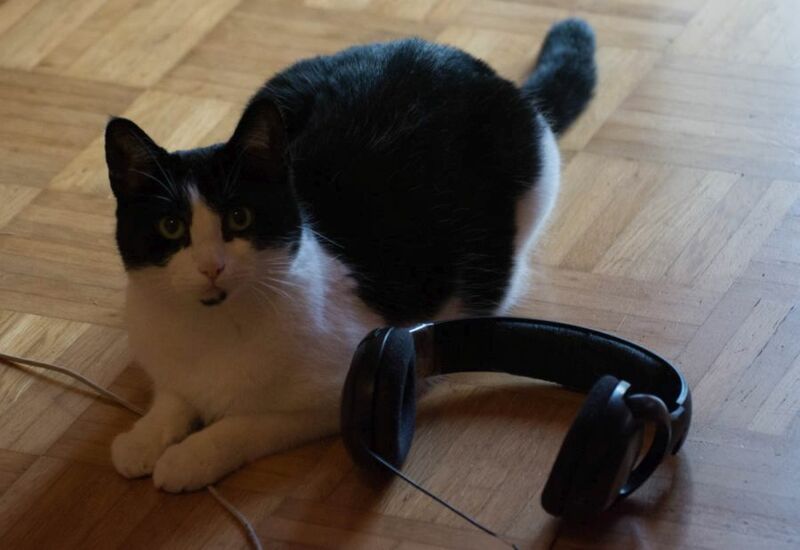 If you wonder why I took a photo of my cat beside headphones, there is a simple and funny explanation. Believe it or not, my cat loves music, but only relaxing and soft music. I discovered this a while back when I did throw my headphones on my couch as I had to answer a phone call, and meanwhile my cat jumped on the couch to listen to the piano music that came from the headphones. At first I thought it would just be cat’s curiosity, but she did rub her nose and fur on the headphones, similar to when she rubs her fur on my legs when I come home. To me it was clear, she seemed to enjoy the soft music from the headphones. If you want to know if your cat likes relaxing and soft music, put the headphones on the ground and see what happens. I probably don’t have to mention it, but I do it anyway… never put the headphones on your cat’s ears, only let her sit beside the headphones. At a later point, I tried to show her piano music on loudspeakers, but no, she prefers to sit down near the headphones. I think it’s the fact that the music is very silent and muffled if she sits near the headphones. My personal curiosity was activated, I typed music for cats into the YouTube search, and to my surprise there was a lot of relaxing music in the search results. Call me crazy, I think she doesn’t like all the songs, but I think she has some favorite tracks. By the way, most of the tracks in the search results are not specifically composed for cats, but believe it or not, there is music out there specifically composed for cats. One day when I was bored, I read some articles and stumbled over an article about music specifically composed for cats. I was curious, there was a track mentioned within the article, and I had luck and found the track on YouTube. After I finished reading the article, I thought it would be a complete joke, but at least in the case with my cat it wasn’t, because she loved the music specifically composed for cats. It seems you can’t find the track anymore on YouTube, but your cat can however listen to a free sample on the site that is even called Music for Cats, just click on listen on the website’s menu you’ll find the mentioned free sample track. With this special music, my cat even started purring, and to my surprise the music was pretty accepted by my cat. Even if this particular website claims that the composed cat music is verified by science, I wouldn’t interpret too much into it. For me it’s clear, everything that keeps my cat busy and happy is good. Do I believe that cats love music? Even if my article title claims it too, I’d rather say that cats love new situations, and headphones on the ground with calming music might be that new situation. My cat likes relaxing tracks that are not composed for cats as same as the music that is specifically composed for cats. Maybe it’s not even really about the music, but who knows other than your cat. If your cat enjoys the time beside the headphones, it could also just mean your cat appreciates that you paid attention to your cat on a way that you have put her in an interesting and new situation. If that’s the only reason why your cat looks relaxed, it might not be the music, but it’s still something good. I mentioned this often, I like the idea to keep my cat busy, to activate her brain cells with different methods. Headphones on the ground with relaxing and soft music seemed to achieve exactly that, my cat becomes curious and spends a good time. [ Smiles ] That is one beautiful-looking cat! That’s a lovely photo of Shyna Dennis and I’m very interested in the idea of music for cats. I had no idea either. I don’t know that Polly would be interested but it would be fun to see what she does. Of course cats have very good hearing so maybe some arrangements of notes and pitch appeal more than others. I can’t imagine cats would like heavy metal for instance. In your case Shyna is used to hearing you play the guitar so probably picks up musical sounds more easily. It might not be scientific fact but as you say if it makes them happy who cares? Yes, wether it is about the music or that the cat sees an interesting new situation with the headphones and melodies on the ground, it doesn’t really matter, what matters is that the cat is kept busy or relaxed 🙂 Since Shyna can be at times difficult to keep busy, a little bit of extra creativity often solves the issue 😀 It’s however funny that Shyna started the idea with the music back then, and since that time she sometimes gets the headphones on the ground. It’s funny… I should record a video of it some day. I am sure that was it and not an insult to your guitar playing :-). Wonder if she likes to watch your fingers moving over the strings. I’ll have to try this with Scooby. It will be interesting to see if he responds differently than he does to the music on my exercise videos, which he hates. He’s an old man now but he still has the curiosity of a kitten. It’s fun to see his reaction to things. Will try the music thing with my cats!